There are three stages in the formation of Marian Catechists. A five-minute examination of conscience each evening, before retiring. Thirty-day Ignatian retreat (this retreat, which is centered on the Spiritual Exercises of Saint Ignatius of Loyola, may be requested by members following completion of the Basic Catholic Catechism Course Revised and Updated by Raymond Leo Cardinal Burke . Please contact the International Office when you have completed the course and would like more detailed information about the retreat. Doctrinal Formation: In this first stage, doctrinal formation includes the study of Father Hardon’s Basic Catholic Catechism Course Revised and Updated by Raymond Leo Cardinal Burke and Cardinal Burke’s Commentary on the General Directory for Catechesis (CGDC). Spiritual Practices: The spiritual practices in this stage remain the same as in the Candidacy Stage, with certain exceptions, as listed below. These practices are to become habitual. Doctrinal Formation: The second stage requires the completion of Father Hardon’s 36-lesson Advanced Catholic Catechist’s Course. Catechetical Activity: The candidate is to engage in some catechetical activity, depending on his or her type of membership (active or contemplative). The third and final stage begins with the Solemn Consecration to the Sacred Heart of Jesus through the Immaculate Heart of Mary. Prior to making the Consecration, candidates are to have completed all the doctrinal and spiritual formation requirements and are to submit a formal written request for Consecration to the Episcopal Moderator stating why they desire to be a Marian Catechist and how they will work in the Church’s apostolate of catechesis. A more detailed discussion of the Consecration may be found below. Spiritual practices: The spiritual practices of the Consecrated Marian Catechist are the same as the spiritual practices in Pre-Commitment Stage. The basic difference is that a solemn, public commitment—the Consecration to the Sacred Heart of Jesus through the Immaculate Heart of Mary—has been made, and the graces of Consecration are available to the catechist. Doctrinal formation: Doctrinal formation is a lifelong process. A Consecrated Marian Catechist is committed to deepening his or her understanding of the Catholic Faith, as found in Sacred Scripture, Sacred Tradition and the magisterial teachings of the Church, in fidelity to our Holy Father, the Pope. The study of Father Hardon’s Masters of the Spiritual Life Course is highly recommended..
Catechetical Activity: The Consecrated Marian Catechist is to work with other Marian Catechists in disseminating the revealed truths of the Catholic faith to others as set forth in the General Directory for Catechesis and explained in the Commentary on the General Directory for Catechesis. As mentioned previously, the third and final stage of Marian Catechist formation begins with the Solemn Consecration to the Sacred Heart of Jesus through the Immaculate Heart of Mary on the date chosen by the Episcopal Moderator. Consecration bestows particular graces that assist the catechist in passing on the Faith to others. In addition, Consecration through Mary, the Mother of God, allows her to draw us closer to her Son, that we may be true and loyal co-workers with Christ in bringing His truth and His selfless love into the world. The Consecration involves a one-year commitment of prayer, frequent reception of the Sacraments, continued study, and catechetical activity, according to the guidelines originally established by Father Hardon. It does not possess the canonical status of a vow, and is not binding under penalty of sin, and may be renewed annually, on the date chosen by the Apostolate’s Episcopal Moderator and International Director. 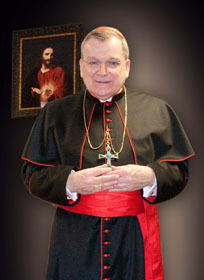 Everyone who hopes to make or renew his or her Consecration is to submit a letter to Cardinal Burke through the International Office no later than May 1st of each year in which the Consecration is to be made. The letter requesting Consecration should be limited to one page, preferably typewritten. If the Consecration cannot be made on the date selected by the Episcopal Moderator, the letter must include a request for a dispensation from the date. Upon receiving approval, the candidate is ready to make his or her Consecration. No one becomes a Marian Catechist for prestige, or to be admired within the community of faithful Catholics. Christ gave such persons fair warning: “Beware of practicing your piety before men in order to be seen by them; for then you will have no reward from your Father who is in heaven” (Matthew 6:1). We become Consecrated Marian Catechists in order to work in Christ’s vineyard, to catechize with Christ’s truth and to radiate His love in every direction.